Drone Crashes Into Crowd at Great Bull Run in Va.
A small drone being used to capture video of a bull run in Virginia crashed into the crowd Saturday. The spider-like drone crashed just before noon at the Virginia Motorsports Park during the Great Bull Run, The Washington Post reported. Several people suffered minor injuries, but none were taken to the hospital. According to WTVR-Channel 6 in Richmond, the drone suddenly dipped down as it hovered over the crowd and dropped onto spectators below. The drone was carrying a camera for WTVR but did not belong to the station, Poynter reported. The Great Bull Run will take place in several other cities over the next year and is inspired by the annual running of the bulls in Pamplona, Spain. 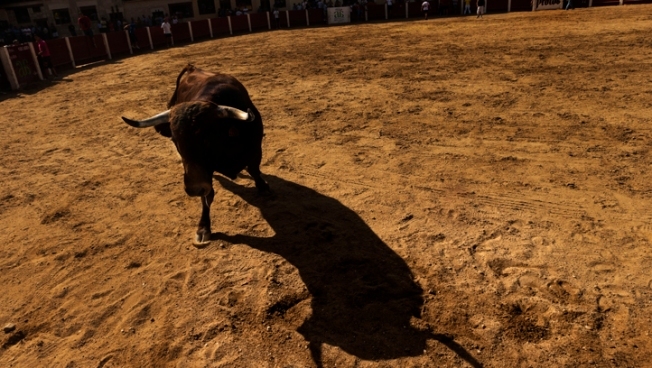 Inspired by Pamplona, Great Bull Run Coming to U.S.
Running of the Bulls Comes to Va.